There’s no doubt that the mental image most of us have of a London Bus is the classic double decker buses like this old AEC Routemaster. These days, of course, the double decker buses are mostly quite modern compared to this and there are even, gasp, single level buses! But if you go to London, you want a genuine London bus! So, I was thrilled when I discovered that there was a heritage route in London. It was actually an accidental discovery as I saw a classic London bus rumbling up the street towards me one afternoon. You could have knocked me over with a feather I was so excited. You see, I have long held a fascination for the classic London bus. When I was little, my Uncle had one on a shelf in his home, a souvenir from a past trip to London. I’m sure it was the bright red that caught my attention at that young age. Whatever the case, I desperately wanted that London bus to be my own personal toy, but it was to be an unrequited love. So, you can understand my excitement on seeing one in person. And hopefully you can also appreciate my motivation in creating this classic London bus art! 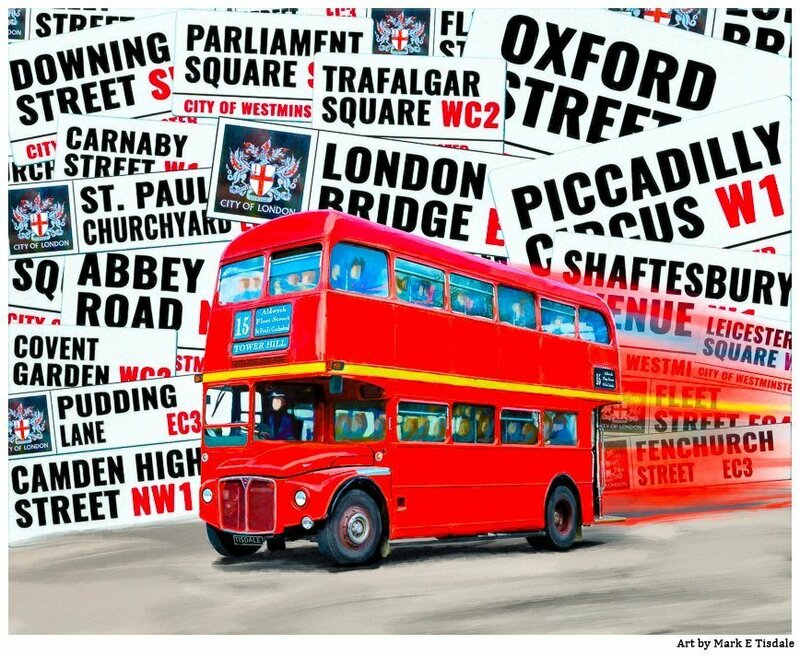 And it captures both my personal love of those old red double deckers as well as the beautiful city of London. The backdrop to this piece is a collection of London street signs. And I’m sure that you’ll recognize the names of many of those London streets from Abbey Road to Piccadilly Circus and everything in between! Just reading the names brings back beautiful memories of the old city and those classic routemasters. Do you also have a fondness for the classic London bus? 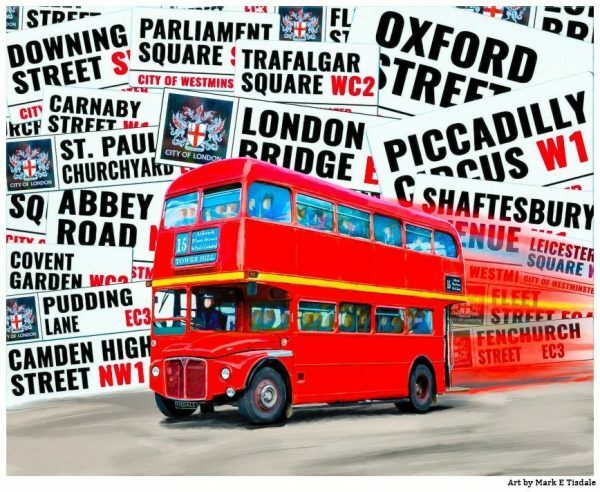 Or does this print remind you of your favorite places in London? I do hope you’ll take a moment to share what strikes you most about this British art?